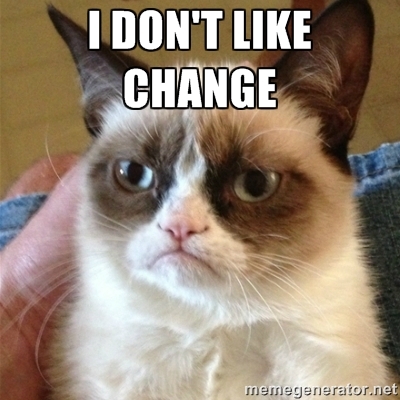 Change: It’s a good thing! Just when you were all getting used to my painting techniques with either chalk paint or spray paint, I decided to mix it up. Enter ProClassic® Interior Acrylic Latex Enamel. This is officially my new go-to paint when I want a clean look with no distressing. Basically, the ProClassic is a water-based paint which has the durability and smoothness of oil-based paints. I’ve been wanting to try it for quite some time, but I’ve always been content with my regular methods. Besides, who likes change? 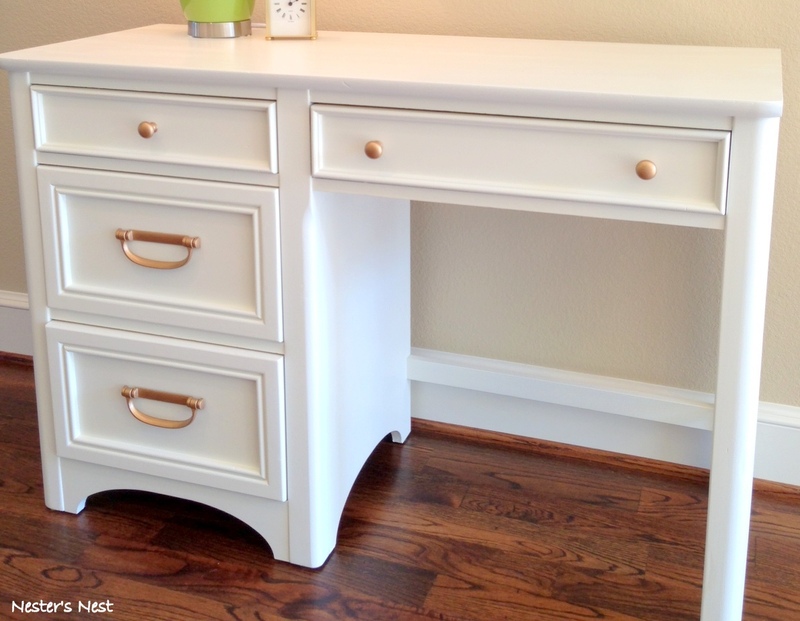 When I spotted this desk at a garage sale, I knew it was officially time to step out of my chalk paint comfort zone and give ProClassic a whirl. If only I could get my kids to do the same with vegetables, but I digress. 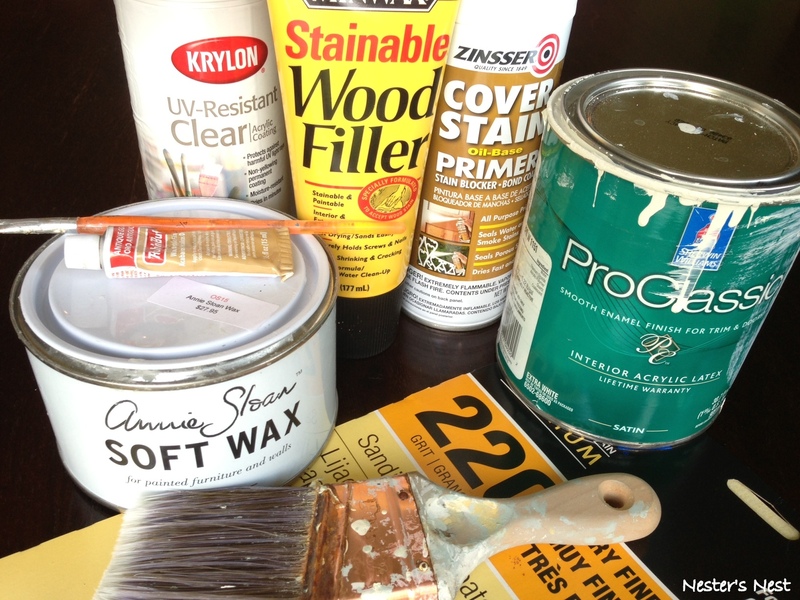 After getting Sherwin-Williams to mix up a quart of White Dove in ProClassic’s satin finish, I gathered up the rest of my supplies and got started. Once I began the prep work, I came across a problem I had never encountered before. 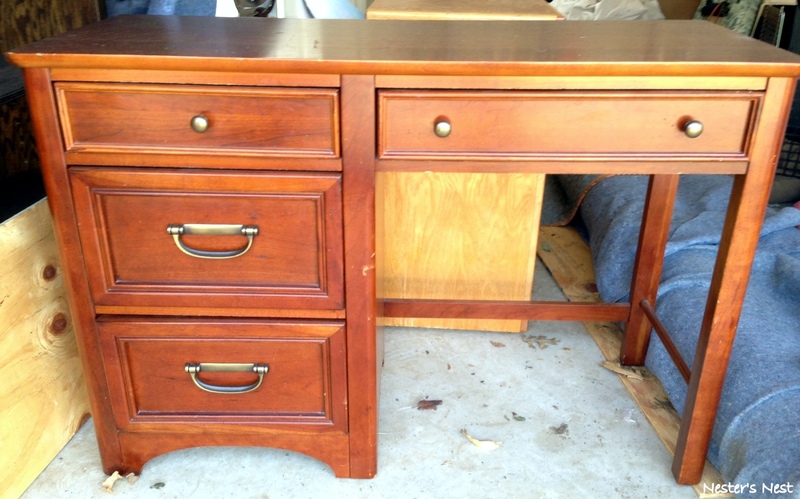 I could not remove the desk drawers. It was literally impossible. 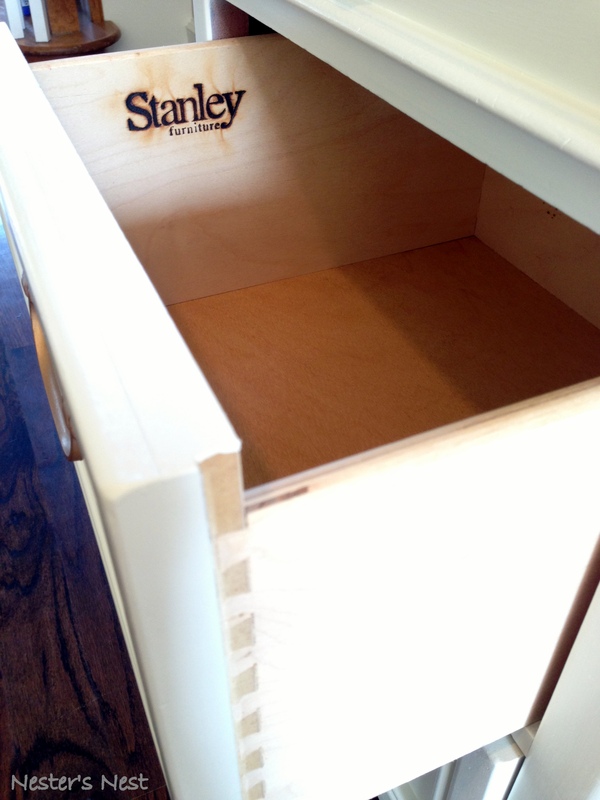 I finally came to the realization that in order to remove the drawers I would have to remove the backing on the desk, which was not only screwed in, but also stapled. So, I came up with plan B….tin foil. 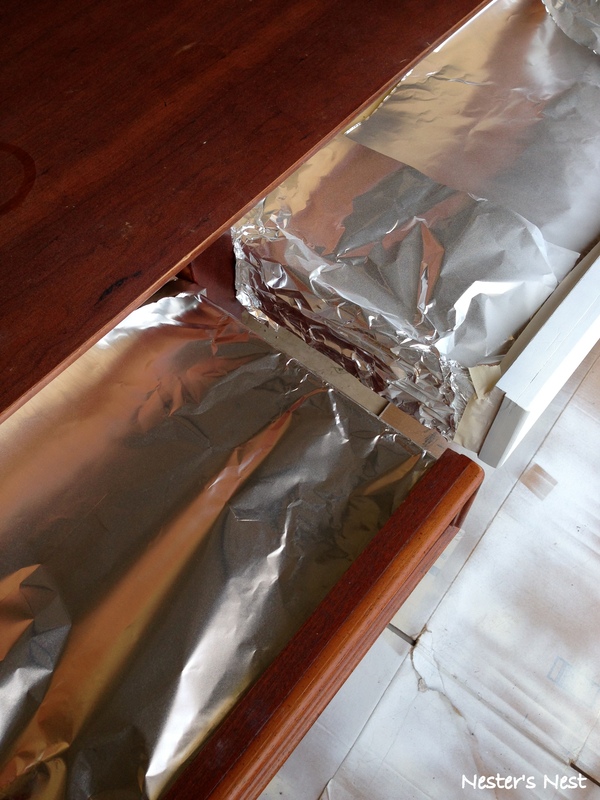 Did you know that tin foil is an excellent tool when trying to protect furniture from over spray or paint drips? Who knew? After all the sanding, wood filling, taping, tin foiling, etc… I sprayed on a good coat of primer. Do you know what else I learned while working on this desk? When it’s a bazillion degrees outside and you are getting eaten by mosquitoes the size of pterodactyls, you get rushed and a little careless, which results in getting primer not only on your project, but also all over you. 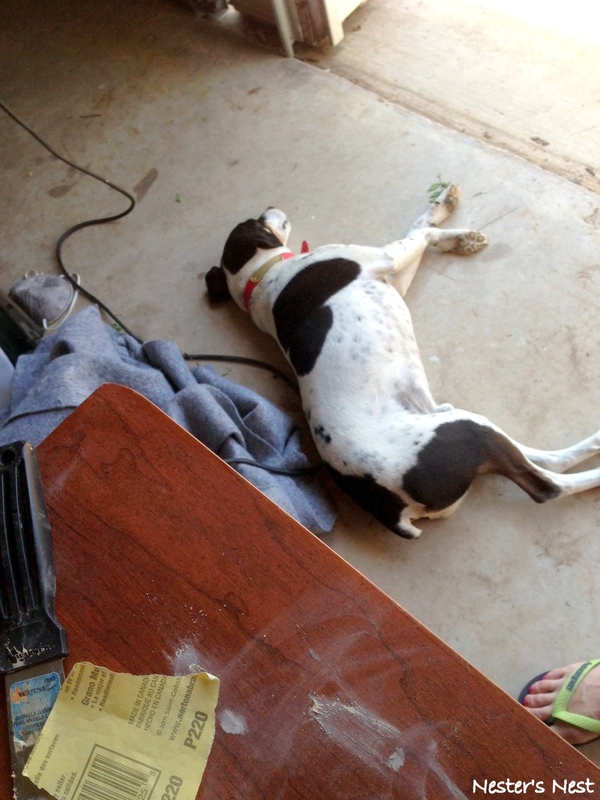 Luckily, Jack didn’t suffer my same fate and kept his distance while staying just close enough to remain loyal. 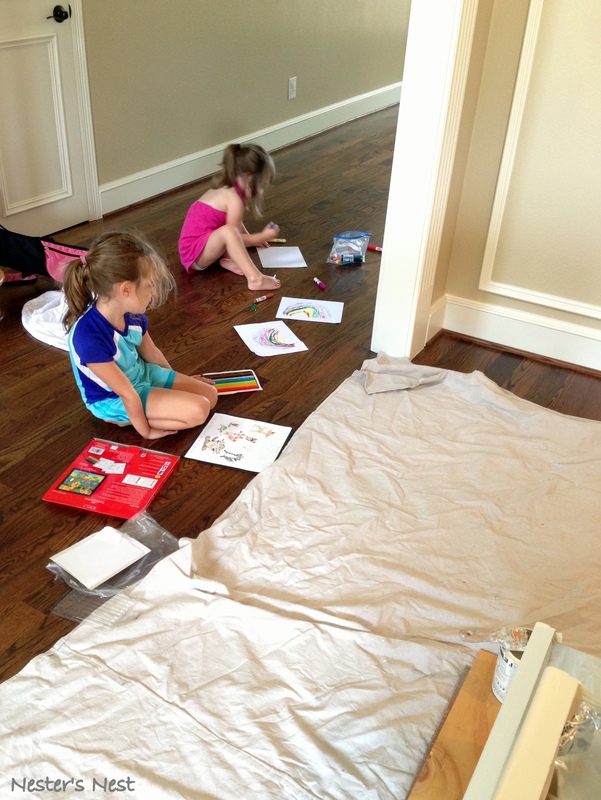 Once the hard part was complete, I brought the desk inside to paint (thank goodness!) where my girls could keep me company. 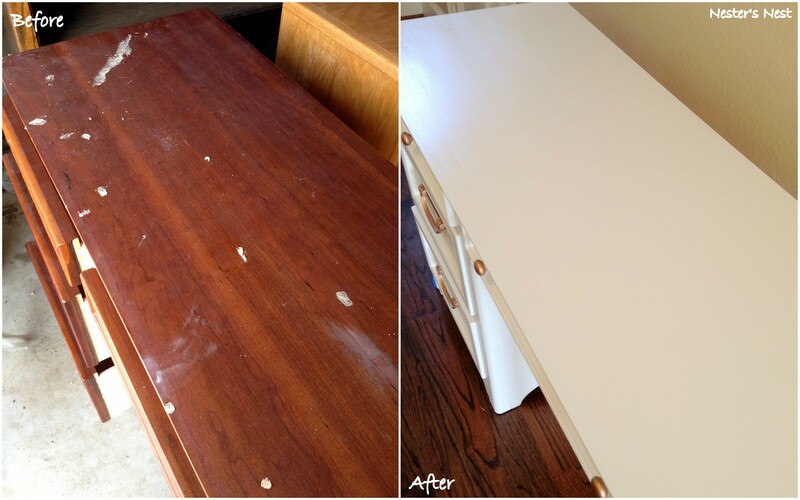 The ProClassic went on smooth as silk and only required two coats. 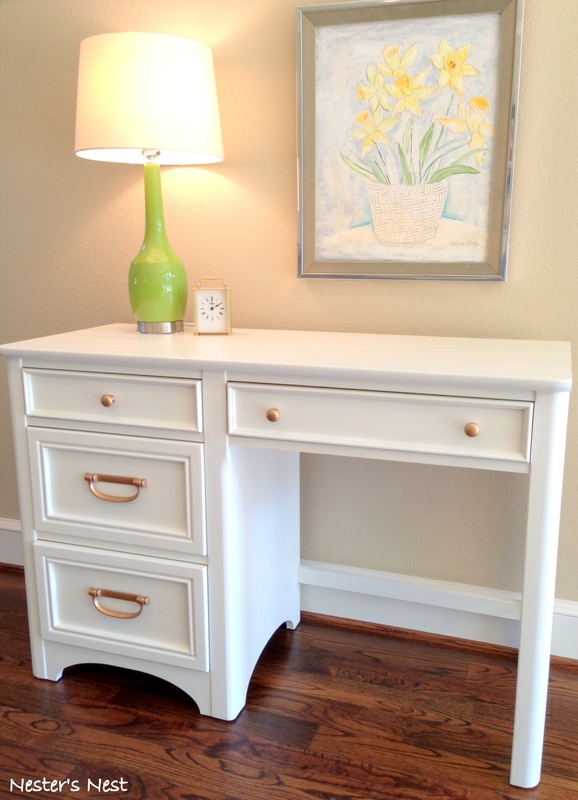 The biggest difference between painting with chalk paint and enamel paint is the dry time. 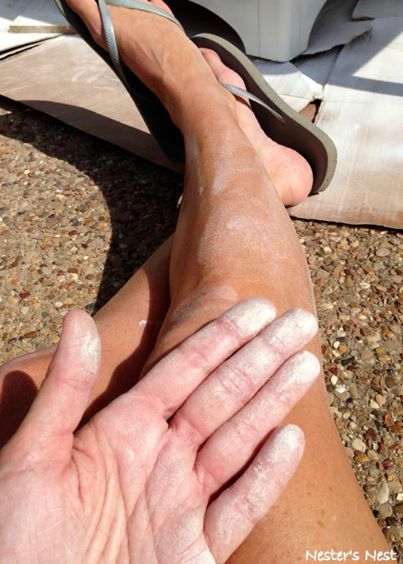 While chalk paint only takes about 30-60 minutes to dry, it took a good 4-6 hours of dry time between coats of the ProClassic, but the end result was a smooth, highly durable finish with minimal brush strokes. 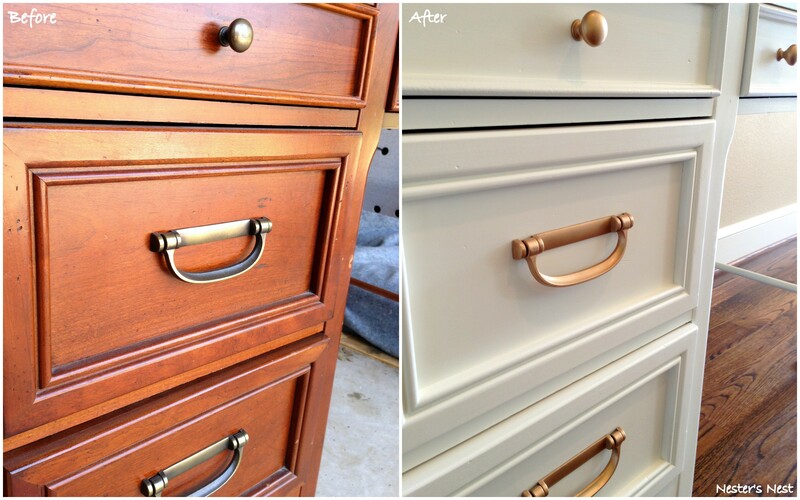 After applying the second coat of paint, I waited a full 24 hours before applying 2 coats Annie Sloan Wax as a protectant. 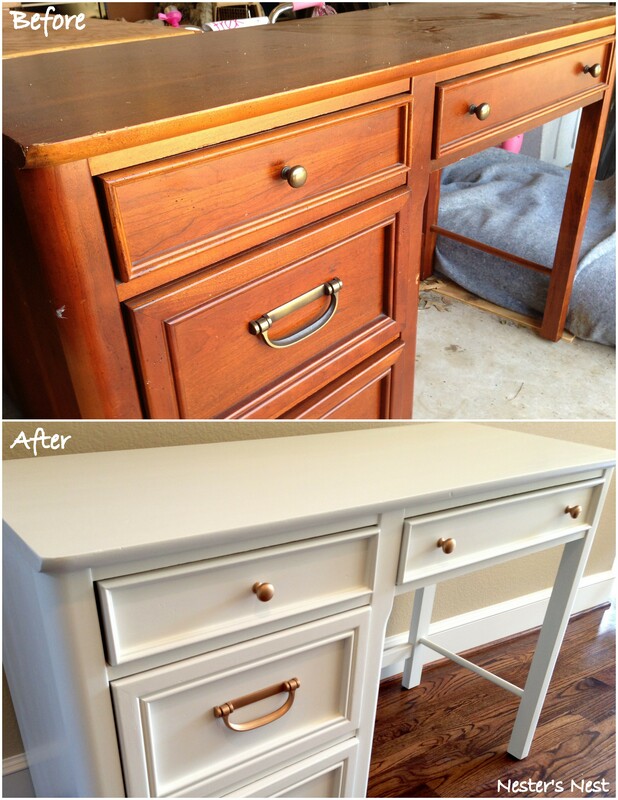 The enamel paint was probably strong enough on its own, but I wanted to give the desk extra durability. I chose wax because I have heard too many horror stories about water-based polycrylic yellowing white paint (in spite of its non-yellowing claims). I also prefer the look of a waxed finish. The dry time between coats of Annie Sloan’s wax is 24 hours, but again, the wait time was worth it. 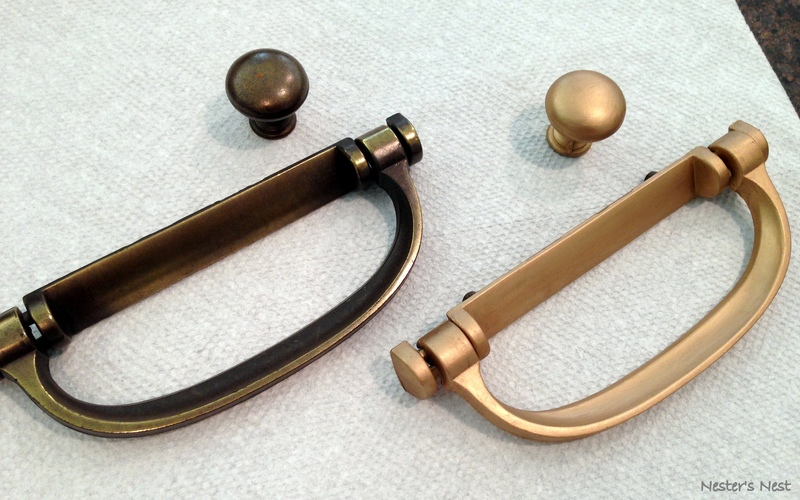 While waiting for the desk to dry I used my trusty Rub-N-Buff in Antique Gold to freshen up the hardware. To keep the finish in tact I followed up with two coats of clear gloss protectant.